Venezuela’s colectivos are a myth created by the country’s elites to discredit the struggle for socialism and grassroots democracy. A specter is haunting Venezuela — the specter of the colectivos. All the powers of old Venezuela have entered into a holy alliance to exorcise it: political parties, NGOs, the foreign press, and of course, Twitter users. “Armed thugs,” “vigilantes,” “paramilitaries” — these are just a few of the hyperbolic terms attached to what has suddenly emerged as the central bogeyman of the Venezuelan opposition today: “los colectivos.” The story goes something like this: amid the recent protests by mostly middle-class and opposition students, it was not only Venezuela’s police and military that repressed the “peaceful” protesters, but also groups of pro-Chavista thugs who terrorized and attacked the well-meaning demonstrators. The recently popularized term says so little but seems to mean so much. It is in the gap between what the term says and what it means that we can locate its function in the contemporary Venezuelan crisis. On the surface, colectivos refers to the grassroots revolutionary collectives that make up the most organized element of chavismo. Beyond this, the term loses all clarity. On February 12, for example, it was widely claimed on Twitter that the student Bassil da Costa was shot by armed collectives. On February 19, videos were circulated claiming that colectivos were rampaging through the wealthy zone of Altamira in Caracas firing hundreds of live rounds. And when the young beauty queen Génesis Carmona was killed, her death was immediately blamed on the colectivos. As it turns out, da Costa was almost certainly killed by uniformed and plainclothes Sebin (intelligence) officials who have since been arrested and charged. Those present were not colectivos, even according to Altamira’s opposition mayor Ramón Muchacho and were not firing live rounds. According to both ballistics evidence and her own friends, Génesis Carmona was shot from behind, while the only Chavistas nearby seem to have been at least several blocks in the opposite direction. And yet these claims and many like them circulated instantly and tirelessly throughout social media, feeding a gullible mainstream and foreign media, often mediated by English-language blogs like Caracas Chronicles . We could add to these examples both the many nonexistent, imagined aggressions as well as the overall death count from the protests. According to one detailed account, of those killed by “unidentified gunmen” — the category we would expect to correlate most directly to the fear of the colectivos — less than one-third were actually opposition protesters. So how can we make sense of the spread of this shadowy concept? The label was certainly not taken on voluntarily. Like many similar terms — notably that of “Tupamaros” (created by the Metropolitan Police in the 1980s to describe urban militants) — colectivos emerged and gained its recent force as a denunciation invented by its enemies. In what Frantz Fanon would call “overdetermination from without,” individuals are identified as collective members prior to choosing that identity themselves. The term’s aspiration to reductive homogenization can be seen in how it is most often rendered with the definite article — the collectives. The colectivos are armed by the opposition’s definition. But only a small sector of revolutionary organizations are in fact armed, while most tarred with the term are not, making the choice of the term peculiar indeed. All of which leaves us with a well-worn set of markers that are simultaneously economic, political, and racial: being poor, dark-skinned, and wearing a red shirt is enough to be deemed a collective member these days. Rather than obscuring its meaning, however, the term’s sheer emptiness speaks directly to its function. The use of colectivos today says more about the one speaking it than the one spoken of. It is not a description of an actual thing in the world, but a confession of a desperate fear that has only grown among Venezuela’s privileged classes in proportion to the increasing political visibility and influence of the poor and darker-skinned. “Colectivos” thus joins a long and sordid list: from the traditional epithets like the rabble, the mob, the scum, the lumpen, and the horde to more specific and recent variants like “Tupamaros” and “terror circles” (widely used to smear the Bolivarian Circles around the time of the 2002 coup). Since nothing strikes more fear in elites’ hearts than the unpredictable movement of the poor beyond the bounds of informal segregation, there’s also motorizados, a term so vague as to trouble translation. Are they motorcycle couriers, moto-taxistas, or simply anyone who happens to be on a motorcycle? Even in more tranquil times, one often sees tweets whipping up a panic that “Tupamaros” are in Altamira, with a blurry photo of a red-shirted motorcyclist provided as evidence of the threat. Still, it does matter that these claims in 2014 Venezuela are as detached from reality as those in 2005 New Orleans — further evidence of the pathologies of anti-Chavismo. The dangers of this myth should not be understated. By dehumanizing all those it broadly describes, the term colectivos legitimizes violence against them (just as the bizarre, racist rumor that the National Guard is infiltrated by Cubans no doubt serves to legitimize sniper attacks). Thus when the retired general Ángel Vivas tweeted the brutal suggestion to hang barbed wire at neck height on the barricades to “neutralize the criminal motorcycle hordes,” seamlessly connecting several fear-inducing pejoratives, multiple deaths seem to have resulted. 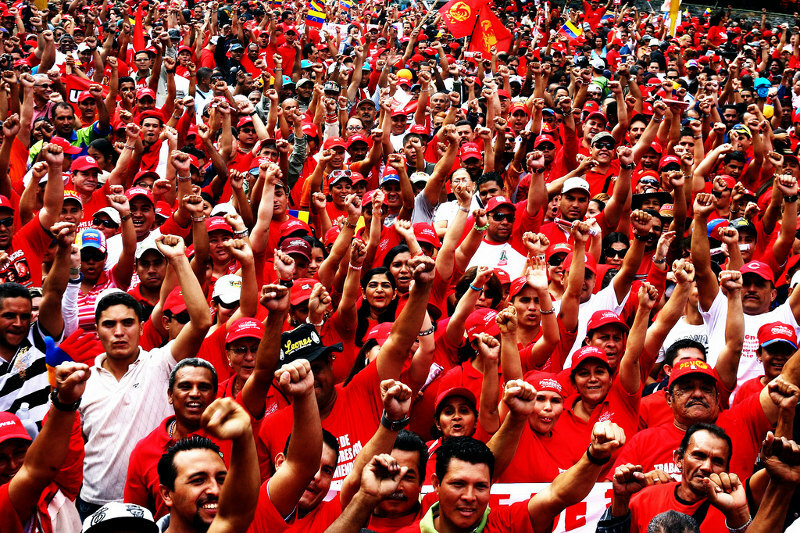 The revolutionary grassroots organizations represent the backbone of the Bolivarian process. A fundamental contradiction pulls at opposition discourse on the colectivos: they are simultaneously denounced for being blind followers of their (now departed) charismatic leader, and also for operating dangerously beyond the authority of the state. The reality is much more the latter. As I document extensively in We Created Chávez , popular revolutionary organizations like those slandered today as colectivos both preceded Chávez and exceed Chavismo in the autonomy they demand and maintain. These revolutionary groupings were active in the mass popular upheaval in 1989 against neoliberalism, coalesced in support of the 1992 coup attempts, and played major roles in supporting Chávez’s election and government while insisting on building their own spaces for autonomous participation, often in tension with that government (sometimes productively so, sometimes not). It is no coincidence that Iturriza, for whom the collectives are synonymous with organization, is also the current Minister of Communes, as much popular energy has been directed toward the communal project in recent years. This is because those popular organizations so slandered today as colectivos have always stood at the forefront of the struggle for a new kind of state and new kind of productive apparatus that the communes promise. In this struggle, the movements often outpaced and leapt beyond not only the state but their own leaders. The demand for both socialism and a more direct form of democracy to replace Venezuela’s corrupt, two-party liberal democracy emerged directly from decades of struggle. Long before the Bolivarian government institutionalized communal councils in 2006 for directly democratic participation and decision-making on the local level, those engaged in grassroots struggles had pioneered barrio assemblies. Years before Venezuela’s communes entered into the law in 2010, movements were building these from below, and if their autonomy was not perfectly clear, the National Commoner Network — initially a state-affiliated institution — quickly detached itself from the state to operate independently. What the communes embody today is the hope that popular participation will continue to expand — and that it will gain some economic teeth. By drawing together institutions of political participation with economic production, the hope is that socialism will be able to emerge hand-in-hand with the ever-more-ambitious claim to popular self-government. The task is far from an easy one and the future far from certain, as the nascent communes frighten not only the Venezuelan opposition, but also entrenched Chavista political and economic elites as well. If the poor and radical sectors are not in the streets alongside these protests, despite the fact that they often suffer the same shortages, it is because their envisioned solution does not involve handing more oil money over to comprador capitalists who produce nothing at all, but cutting them out of the equation entirely. Many recognize that this can only be considered once the country’s productive base has been rebuilt on entirely different foundations. Simply breaking the equation of collectives with violence does not mean that there are no armed revolutionary groups in Venezuela, however. The question of the monopoly of violence is a complex one, and at no point was this more evident than during the brief coup against Chávez and the constitution twelve years ago. That failed coup, which was justified by the same sorts of violent street clashes we see today, gave us a good picture of what the Venezuelan opposition would look like in power: all legitimate branches of government abolished, the constitution scrapped, state and grassroots media shut down by force, popular organizations under military attack, and dozens dead in the streets. Some of the very same people currently accusing the Venezuelan government of violating articles of the Constitution were among those who approved of, applauded, or even insisted — as in the case of Leopoldo López — that we should be “proud of” the events of April 2002. So-called collectives know better than to accept the venomous descriptors of the Right, or the insistence by some on the Left that their task is an impossible one. Instead, many simply shrug their shoulders and continue the arduous project of building spaces of revolutionary and self-governed socialism from below, a socialism that emerges not all-at-once and everywhere, but in small islands of self-activity that might eventually constitute a new Venezuela entirely.